Objectives: To assess awareness and use of the current incident reporting system and to identify factors inhibiting reporting of incidents in hospitals. Design, setting and participants: Anonymous survey of 186 doctors and 587 nurses from diverse clinical settings in six South Australian hospitals (response rate = 70.7% and 73.6%, respectively). Main outcome measures: Knowledge and use of the current reporting system; barriers to incident reporting. Results: Most doctors and nurses (98.3%) were aware that their hospital had an incident reporting system. Nurses were more likely than doctors to know how to access a report (88.3% v 43.0%; relative risk (RR) 2.05, 95% CI 1.61 to 2.63), to have ever completed a report (89.2% v 64.4%; RR 1.38, 95% CI 1.19 to 1.61), and to know what to do with the completed report (81.9% v 49.7%; RR 1.65, 95% CI 1.27 to 2.13). Staff were more likely to report incidents which are habitually reported, often witnessed, and usually associated with immediate outcomes such as patient falls and medication errors requiring corrective treatment. Near misses and incidents which occur over time such as pressure ulcers and DVT due to inadequate prophylaxis were least likely to be reported. The most frequently stated barrier to reporting for doctors and nurses was lack of feedback (57.7% and 61.8% agreeing, respectively). Conclusions: Both doctors and nurses believe they should report most incidents, but nurses do so more frequently than doctors. To improve incident reporting, especially among doctors, clarification is needed of which incidents should be reported, the process needs to be simplified, and feedback given to reporters. It is a decade since Leape1 highlighted the need to gather information and redesign hospital systems to minimise errors in health care. Since then, many strategies and tools have been developed to identify and reduce errors.2 More than 90% of consumers believe that healthcare workers should report errors,3 and peak quality and safety organisations4–6 recommend incident reporting to better understand errors and their contributing factors. Incidents occurring infrequently, or those not easily coded through limitations in the existing classification system,7 can miss detection through medical record review. Incident reporting captures more contextual information about incidents8 and, when actively promoted within the clinical setting, it can detect more preventable adverse events than medical record review9 at a fraction of the cost.10 Near misses are rarely documented in medical records,11 yet occur more frequently than adverse events12 and provide valuable lessons in recovery mechanisms without the detrimental consequences of an adverse event.5,6 The subjective data provided by incident reporting enable hypothesis building and preventative strategies to be developed and tested. Despite its strengths, many incidents are not reported probably for the same reasons they are omitted from medical records; they are simply not recognised, and those that are detected after the event are often not dealt with effectively.13 Outside the discipline of anaesthesiology, incident reporting is used predominantly by nurses.14,15 The subjective nature of reports, the lack of consistency and validation of incident data classification, and underreporting constrain incident reporting from being used as a reliable epidemiological tool to measure the frequency of events and whether interventions are effective in improving patient safety.2,14 Studies which have successfully improved incident reporting have often done so through intense facilitation, either through ward rounds9 or staff reminders,10,16 and have questionable sustainability. For incident reporting to be more reliable, both doctors and nurses must provide a representative account of errors occurring in hospitals. The objectives of this study were therefore to investigate by profession: (1) awareness and use of the current incident reporting system; (2) the types of incidents staff were more likely to report and believe should be reported; and (3) the barriers to reporting. A cross sectional survey of doctors and nurses was undertaken between November 2001 and June 2003. Hospitals sampled included three principal referral hospitals (each with >300 acute inpatient beds), one major referral hospital (<200 acute inpatient beds), and two major rural base hospitals (each with <120 acute inpatient beds) in South Australia. Rostered doctors and nurses, and casual agency nurses working in one or more of the four intensive care units (two metropolitan and two rural), four emergency departments (two metropolitan and two rural), five surgical units (three metropolitan and two rural), and seven medical units (five metropolitan and two rural) were invited to participate. Project officers either personally distributed questionnaires to rostered staff and outlined the purpose of the study or, where this was not possible, posted the questionnaire. All doctors were contacted by telephone to encourage participation. To facilitate frank comment without fear of disclosure, the questionnaire was anonymous and self-administered. Ethics committee approval was obtained from each hospital’s relevant body. The questionnaire was modified from one used in an obstetrics unit by Vincent et al17 to make it generalisable to a wider population. Following review by a panel of clinicians to assess content validity, the questionnaire was piloted on 14 doctors and 10 nurses. Test-retest reliability was determined using a kappa statistic, and only questions for which there was at least moderate reproducibility (kappa ⩾0.4) or a consistent endorsement of one option were included. Staff were asked if they knew whether their hospital had an incident reporting system. Those answering in the affirmative were asked whether they knew which form to use, how to access it, and what to do with a completed form. To measure reporting practice, staff were asked to estimate how often they reported 11 patient incidents representing a diverse range of common iatrogenic injuries,18 and how often they believed each should be reported using a 4-point Likert scale (never, <50% of occasions, ⩾50% of occasions, always). To determine barriers to reporting, staff were provided with 19 potential reasons for not reporting incidents and asked to rate on a 5-point Likert scale (1 = strongly agree, 5 = strongly disagree) the degree to which these acted as a deterrent. Comparisons were made for doctors and nurses by profession, level of qualification, years post entry level qualification spent in the acute health sector, and rural/metropolitan location. For knowledge and use of reporting systems and reporting practices, log binomial generalised linear models adjusting for clustering by hospital were used. Likert scales were dichotomised into agree or not agree for reporting barriers and analysed using Fisher’s exact test. The conventional level of p⩽0.05 was taken to represent statistical significance. Concordance between views on current reporting behaviour and necessity of reporting was determined using an intraclass correlation coefficient (ICC). Data were analysed using Stata statistical software Version 7.0 (Stata Corporation, College Station, TX, USA). The overall response rate was 72.8%, and was similar for both doctors and nurses (fig 1). As the questionnaire was anonymous, we were unable to ascertain the demographic features of non-respondents. Nurses had a greater awareness of and used the incident reporting system more than doctors (table 1). Senior doctors (registrars and consultants) were significantly less likely than junior doctors (interns and residents) to have ever completed an incident form (58.4% v 85.4%; relative risk (RR) 0.58, 95% CI 0.46 to 0.73). Doctors with >5 years experience post entry level were less likely to have ever completed an incident report than those with less experience (58.1% v 79.2%; RR 0.73, 95% CI 0.59 to 0.92). There were no significant differences between rural and metropolitan doctors in knowledge or use of the incident reporting system. Senior nurses (nurse managers and clinical nurses) were more likely than junior nurses to know how to access a form (100.0% v 88.0%; RR 1.14, 95% CI 1.09 to 1.18), to know what to do with it (100.0% v 80.9%; RR 1.24, 95% CI 1.13 to 1.35), and to have ever filled one out (100.0% v 89.0%; RR 1.12, 95% CI 1.10 to 1.15). Permanently employed nurses were significantly more likely than contract nurses to know how to locate/access an incident form (89.1% v 57.1%; RR 1.56, 95% CI 1.25 to 1.95), to know what to do with it once completed (82.7% v 50.0%; RR 1.65, 95% CI 1.12 to 2.45), and to have ever filled one out (90.0% v 57.1%; RR 1.57, 95% CI 1.21 to 2.06). Nurses with >5 years post entry level experience were more likely to know how to locate a form (91.5% v 83.8%; RR 1.09, 95% CI 1.04 to 1.14), to know what to do with it once completed (85.5% v 76.7%; RR 1.12, 95% CI 1.06 to 1.17), and to have ever filled out an incident form (94.0% v 82.5%; RR 1.14, 95% CI 1.06 to 1.23) than those with less experience. 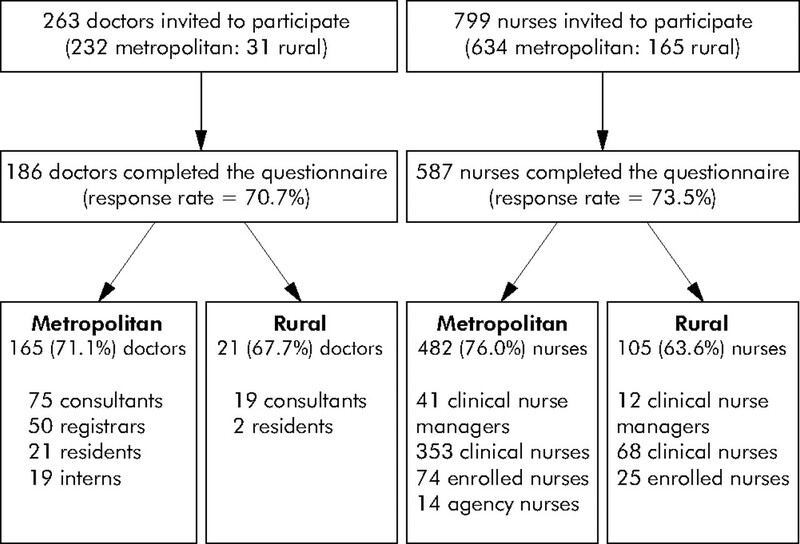 Rural and metropolitan nurses did not differ in their knowledge or use of the incident reporting system. 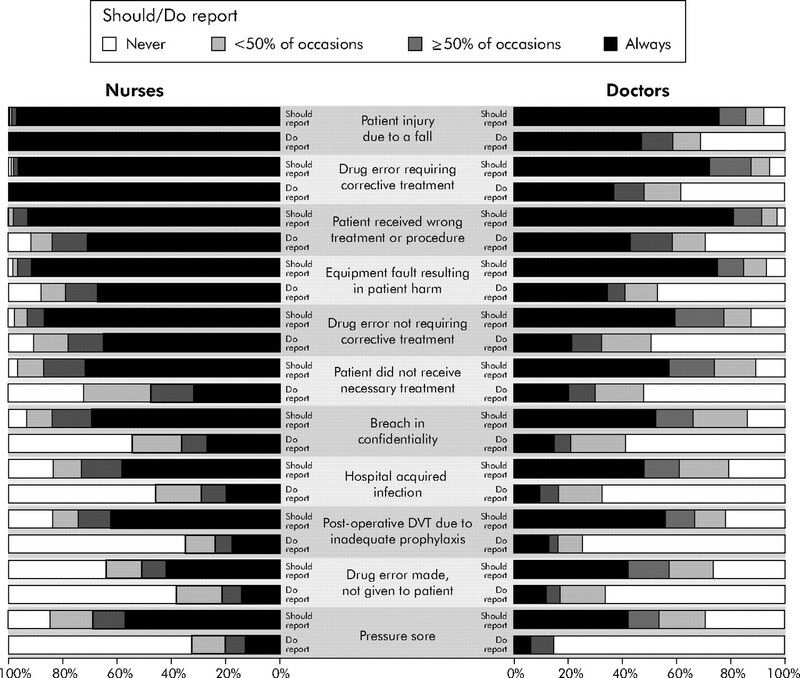 Figure 2 shows, for 11 patient incidents, the percentages of doctors and nurses who perceive they report the incident always, on 50% or more of occasions, less than 50% of occasions, or never, and their views on the necessity of reporting these incidents. Staff self-perception of reporting of incidents. Doctors reported that they completed incident reports most often for patient falls and least often for pressure sores. Doctors’ views ranged from 75.8% who believed that patient falls should always be reported to only 42.1% for drug error “near misses”. Agreement between what doctors did compared with what they thought they should report was low, ranging from an ICC of 0.44 for incidents where a patient received the wrong treatment or procedure to an ICC of 0.17 for pressure sores. Senior doctors were less likely than junior doctors to always report patient falls (38.1% v 74.4%; RR 0.51, 95% CI 0.30 to 0.87) and patients receiving the wrong treatment or procedure (39.5% v 54.1%; RR 0.73, 95% CI 0.63 to 0.84). There were no significant differences in reporting practices among doctors according to rural/metropolitan location. Nurses reported that they completed incident reports most often for patient falls and least often for pressure sores. Nurses regarded falls as the most important incidents to always report and drug error “near misses” as the least important (97.0% and 41.9%, respectively). The correlation between what nurses did compared with what they thought they should report ranged from an ICC of 0.78 for patient falls to an ICC of 0.27 for deep vein thrombosis (DVT) through inadequate prophylaxis. Nurses with <5 years experience were more likely to always report DVT (23.0% v 14.4%; RR 1.60, 95% CI 1.46 to 1.74). There were no significant differences in reporting practices among nurses according to rural/metropolitan location. Table 2 shows that major barriers to reporting for doctors were lack of feedback (57.7%), the incident form taking too long to complete (54.2%), and a belief that the incident was too trivial (51.2%). There were no significant differences for any barriers according to level of qualification, experience, and rural/metropolitan location. Major barriers to reporting for nurses were lack of feedback (61.8%), a belief that there was no point in reporting near misses (49.0%), and forgetting to make a report when the ward is busy (48.1%, table 2). Nurses with >5 years experience were more likely to believe there was no point reporting near misses (52.5% v 44.0%; RR 1.19, 95% CI 1.06 to 1.34) than nurses with less experience. There were no significant differences for any barriers according to level of qualification and rural/metropolitan location. With adverse event rates estimated to be in the range of 2.9%19 to 16.6%18 of acute care hospital admissions, most doctors and nurses working in hospitals will be familiar with a range of adverse events. Despite most staff knowing that an incident reporting system existed, almost a quarter of staff did not know how to access an incident form or what to do with it once completed, and over 40% of consultants and registrars had never completed a report. Nurses were more aware of the reporting system than doctors, although casually employed nurses were significantly less likely than permanent hospital nurses to know how to access a report, and were a third less likely to have ever completed a report. At the time of the survey the AIMS reporting system had been used in each hospital for at least 5 years. The reporting system, which offers statutory immunity to reporters, collects data which are entered retrospectively into a stand alone database within each hospital and is managed by only authorised hospital personnel. Almost two thirds of respondents believed lack of feedback was the greatest deterrent to reporting. Organisational factors relating to structures and processes for reporting,20 such as inadequate feedback, long forms and insufficient time to report, were identified as the major barriers. Many of our results support those obtained internationally, including the finding that only a small percentage of doctors formally report incidents,20,21 and unfamiliarity with the reporting process results in a poorer reporting culture.22 Whereas other studies identified cultural issues such as fear of disciplinary action,17,23 legal ramifications, and workplace discrimination24 as barriers to reporting, our study, like that of Uribe et al,20 did not identify these issues to be major reporting obstacles. Poor reporting practices by doctors and the fact that they did not identify cultural barriers so much as organisational barriers to reporting probably reflects the prevailing deeply entrenched belief in medicine that only bad doctors make mistakes. There were a number of limitations to this study. This survey formed baseline data for a matched controlled study in which purposive sampling was undertaken to reduce contamination between intervention and control units and to ensure a variety of areas were represented. Despite non-probability sampling being less ideal than random selection,25 our findings were similar to those determined by Vincent et al17 in a distant healthcare setting, which suggests that the results are representative. Non-responder bias cannot be excluded as we were unable to collect information on non-responders due to the anonymous design of the survey. There may be potentially important variables and barriers not included in the questionnaire because we needed to limit questionnaire burden. Despite being anonymous, respondents may have provided more socially acceptable responses for fear of identification, which might explain why cultural barriers were not reported as significant deterrents to reporting. We did not investigate why staff reported certain incidents more frequently than others. Perhaps staff did not view them as incidents, or believed tools exist to detect/monitor them or that, in the case of senior medical staff, they delegate reporting to junior staff. Further research is required to explore why senior medical staff do not support reporting and why iatrogenic injuries with potentially disastrous consequences such as DVT and hospital acquired infections are poorly reported. Our data suggest that the move towards more casual nurses26 could result in a further decline in the number and types of reports submitted, which requires action if incident reporting is to be valued as an important component of each hospital’s risk management framework. Balancing the requirement to receive adequate information on an incident report to enable meaningful analysis and follow up with the clinician’s desire to make it less time consuming is an ongoing concern. Faster reporting systems, combined with adequate resources and infrastructure to enable responsive action and feedback, need to be adopted. The use of personal digital assistants,27 call centres to collect information,28 and techniques such as root cause analysis29 to investigate incidents offers possibilities to enable safer health care to be delivered. Perhaps the most challenging task is ensuring that practice improvements resulting from reports are disseminated to clinicians, because only then will incident reporting be seen as worthwhile and relevant. The authors thank Rhonda Bills, Clinical Epidemiology Unit for administrative support; Dr Deborah Turnball, Department of General Practice, University of Adelaide and Lora DalGrande, Centre for Population Studies in Epidemiology, SA Department of Human Services for valuable advice on questionnaire construct and format; and the staff of the participating hospitals for completing the questionnaire. Shojania KG, Duncan BW, McDonald KM, et al. Making health care safer: a critical analysis of patient safety practices. Evid Rep Technol Assess (Summ) 2001;43:1–668. Evans SM, Berry JG, Smith BJ, et al. Anonymity or transparency in reporting of medical error: a community-based survey in South Australia. Med J Aust 2004;180:577–80. Australian Council for Safety and Quality in Health Care. Safety in numbers. A technical options paper for a national approach to the use of data for safer health care. Canberra: Commonwealth of Australia, 2001. Department of Health. An organisation with a memory. London: Stationery Office, 2000. Kohn LT, Corrigan JM, Donaldson MS. To err is human: building a safer health system. Washington, DC: National Academy Press, 2000:1–16. Runciman WB, Moller J. Iatrogenic injury in Australia. A report prepared by the Australian Patient Safety Foundation for the National Health Priorities and Quality Branch of the Department of Health and Aged Care of the Commonwealth Government of Australia. Adelaide, South Australia: Australian Patient Safety Foundation, 2001. Runciman WB, Merry A. A tragic death: a time to blame or a time to learn? Qual Saf Health Care2003;12:321–2. Beckmann U, Bohringer C, Carless R, et al. Evaluation of two methods for quality improvement in intensive care: facilitated incident monitoring and retrospective medical chart review. Crit Care Med 2003;31:1006–11. O’Neil AC, Petersen LA, Cook EF, et al. Physician reporting compared with medical record review to identify adverse medical events. Ann Intern Med 1993;119:370–6. Neale G, Woloshynowych M. Retrospective case record review: a blunt instrument that needs sharpening. Qual Saf Health Care2003;12:2–3. Johnson CW. How will we get the data and what will we do with it then? Issues in the reporting of adverse healthcare events. Qual Saf Health Care2003;12 (Suppl II) :ii64–7. Kingston MJ, Evans SM, Smith BJ, et al. Attitudes of doctors and nurses towards incident reporting: a qualitative analysis. Med J Aust 2004;181:36–9. Welsh CH, Pedot R, Anderson RJ. Use of morning report to enhance adverse event detection. J Gen Intern Med1996;11:454–60. Vincent C, Stanhope N, Crowley-Murphy M. Reasons for not reporting adverse incidents: an empirical study. J Eval Clin Pract1999;5:13–21. Uribe CL, Schweikhart SB, Pathak DS, et al. Perceived barriers to medical-error reporting: an exploratory investigation. J Healthc Manag 2002;47:263–79. Eland IA, Belton KJ, van Grootheest AC, et al. Attitudinal survey of voluntary reporting of adverse drug reactions. Br J Clin Pharmacol 1999;48:623–7. Firth-Cozens J. Barriers to incident reporting. Qual Health Care2002;11:7. Elnitsky C, Nichols B, Palmer K. Are hospital incidents being reported? J Nurs Admin1997;27:40–6. Creswell J. Research design: qualitative, quantitative and mixed methods approaches. 2nd edition. California, US: Sage Publications, 2003. Richardson S, Allen J. Casualization of the nursing workforce: a New Zealand perspective on an international phenomenon. Int J Nurs Prac2001;7:104–8. Bent PD, Bolsin SN, Creati BJ, et al. Professional monitoring and critical incident reporting using personal digital assistants. Med J Aust 2002;177:496–9. Evans S. Evaluation of an incident reporting to improve hospital systems (IRIS) project. April 2003. Available at http://www.safetyandquality.sa.gov.au/site/page.cfm?area_id=10&nav_id=506 (accessed 25 October 2005). New South Wales Department of Health. Patient Safety and Clinical Quality Program: First Report on Incident Management in the NSW Public Health System 2003–2004. NSW, Australia: NSW Department of Health, 2005, Available at http://www.health.nsw.gov.au/pubs/2005/incident_mgmnt.html (accessed 25 October 2005).